Urochloa spp. grow vigorously in the dry-season of the tropics, and have been used successfully to provide abundant surface residue as cover crop for no-till soybean (Glycine max). 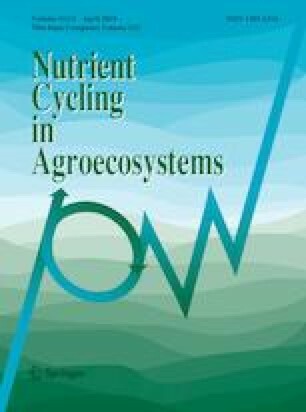 Nitrogen (N) fertilizer application could enhance cover crop biomass production and its ground cover and accelerate residue decomposition, but how these cascading factors affect nutrient availability to the subsequent soybean crop is not known. We evaluated nutrient cycling and soybean nutrition and yield components following different timings of N application to living and desiccated Urochloa cover crops. The experiment was conducted in two growing seasons at Botucatu, São Paulo State, Brazil. Treatments consisted of two cover crop grasses (Urochloa brizantha and Urochloa ruziziensis) and six N management systems [control (no N application); N application at soybean sowing (40 kg N ha−1) plus topdressing (60 kg N ha−1 at V5 stage); N application 20 days before desiccation (DBD) of cover crops, N application 10 DBD; N application 5 DBD; and N application 1 day before sowing of soybean, using the rate of 100 kg N ha−1 in the latter four treatments]. Both cover crops produced high amount of shoot biomass (> 9.7 Mg ha−1), but U. brizantha was 48% more productive than U. ruziziensis. Nutrient accumulation in cover crop straw was enhanced due to greater biomass production in treatments with N applied 20 and 10 DBD. Soybean grain yield was 17% greater following U. brizantha than following U. ruziziensis. Nitrogen application at different times did not affect soybean grain yield. These results suggest that Urochloa biomass, macronutrient accumulation, and subsequent release rates can be enhanced with N application, but it had little short-term impact on soybean yield components. The authors would like to thank the Coordination of Improvement of Higher Education Personnel (CAPES) for the financial support, as well as the National Council for Scientific and Technological Development (CNPq) for an award for excellence in research to the second, third, and eighth authors.